Supralympic Runners is a first-person competitive endless runner from Uranium Soda Studio. 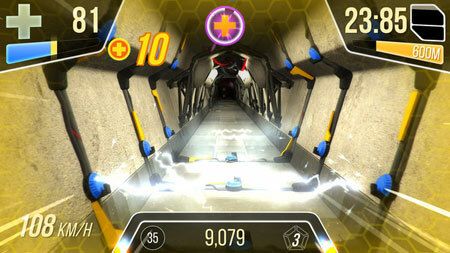 Experience the perfectly-shaped, fully mechanized, rocket-powered supralympian runner. You will play as an heavily fitted athletic champion. Nerves of steel are highly required to compete for the worldwide leading position. Embraced the life of a supralympian athlete. You have been training over and over to master and improve this high-tech body. Run as far as you can, avoid obstacles and hurry up while the Stungate is still open, which is a gate kept by a giant compressor. It’s 50,000 tons of tungsten-titanium waiting to fall upon your head if you are late. If you manage to cross 5 Stungates, you complete a stage. You have a few seconds of respite during which you can take a look at the cityscape. But don’t relax too much, each completed stage means a new deadly obstacle into the death row. The game features 10 types of deadly obstacles to spell the end of each and every round, 8 types of collectable bonus to get extra-backing, and 3 ranges of armor kits to push the deadline back. Forward Speed Control – You can manage your running speed with your back thruster. This speed is driven with physic-based parameters : thrust of motor and legs and body drag. Lateral Control – You can freely and continuously move laterally between bounding walls. The fastest you run forward, the slowest you run laterally, following a specific curve. Vertical Control – Vertical speed is not only driven by gravity but also by motor thrust. You have the ability not only to sustain jumps but also to dive lightning-fast into the ground. This entry was posted in PC Games, Walkthrough and tagged Supralympic Runners Cheats, Supralympic Runners Gameplay, Supralympic Runners Guide, Supralympic Runners Strategy, Supralympic Runners Tutorial, Supralympic Runners Walkthrough by Marvin. Bookmark the permalink.